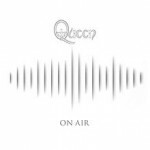 Share the post "Album review: QUEEN – On Air"
Queen have always given the fans a treat around Christmas time in recent years with live releases and now we have the complete BBC radio sessions. There is this, the standard 2CD version and a 6CD version with live radio tracks and radio interviews (from BBC Radio 1 and 2, plus Capital Radio), a real fan treat. The sessions were recorded between 1973 and 1977 – six in total. They recorded five of these between 1973 and 1974, returning after a long break to record their final BBC session in October 1977. The early Queen albums were full of fantasy themed lyrics be it ‘Ogre Battle’ (the 1973 session fair blows your speakers off!) or ‘My Fairy King’, highlighting even in the band’s early years the power of Freddie Mercury’s singing. They were never the critics favourite back in the days these sessions come from, yet as time has shown Queen had the last laugh as the critics are long forgotten yet Queen’s music is as popular now as it has ever been. On the songs the band let loose with lots of embellishments, especially Brian May on his guitar solos adding lots of special effects onto his playing, as can be heard on ‘Flick Of The Wrist’ or ‘Son And Daughter’. There is a fast version of ‘We Will Rock You’ – the biggest hit they recorded in any of these sessions - and it shows a good song can be played in any style. Also included is a personal favourite form the early years, ‘Doing All Right’, a song written in the pre-Queen band Smile by Brian May and Tim Staffell. This entry was posted in ALBUM REVIEWS, ALBUM REVIEWS (Mobile), All Posts and tagged album, BBC, Brian May, Freddie Mercury, John Deacon, On Air, Queen, radio, review, Roger Taylor, Virgin EMI. Bookmark the permalink.